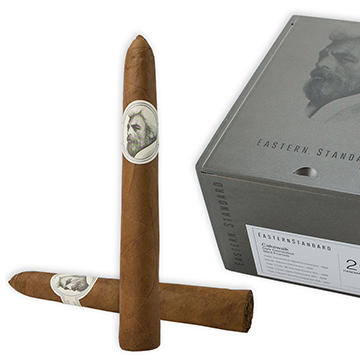 Home » Cigars » Eastern Standard Cigars by Caldwell Cigar Co.
Robert Caldwell announced his return to the cigar industry with the introduction of Eastern Standard cigars, a line of premium cigars from his Caldwell Collection. Robert spent months visiting numerous farms and factories trying to find the right tobaccos and partners with which to work after parting ways with Christian Eiroa and their joint Wynwood Cigar Company venture. Eastern Standard cigars are hand-rolled in the Dominican Republic at the Ventura cigar factory using Nicaraguan Habano and Dominican Criollo '98 Viso and Corojo Ligero long-fillers with a Dominican Habano binder. The wrapper leaf is a wonderful Dark Connecticut hybrid of Connecticut Shade and Brazilian Mata Fina. This creative blending of rare and aged Grade A tobaccos results in a very flavorful, creamy and smooth cigar that moves from mild to medium-bodied with subtle notes of pepper and spice. If you are curious to know who the bearded man on the Eastern Standard cigar band and box is, he sprouted from the mind of Dominican born street artist Evoca1, but likely represents a Finnish man named Hans Nielsen Lahkso whose story is told on a slip of paper included with the box of cigars.